This 2018 Toyota Highlander XLE is offered to you for sale by Kendall Toyota Alaska. Drive home in your new pre-owned vehicle with the knowledge you're fully backed by the CARFAX Buyback Guarantee. Off-road or on the street, this Toyota Highlander XLE handles with ease. Driven by many, but adored by more, the Toyota Highlander XLE is a perfect addition to any home. This is about the time when you're saying it is too good to be true, and let us be the one's to tell you, it is absolutely true. ** CERTIFIED PRE OWNED (CPO) 2018 TOYOTA HIGHLANDER LE PLUS, BLACK CLOTH INTERIOR, 3.5L V6 ENGINE, AUTOMATIC TRANSMISSION (A/T), ALL WHEEL DRIVE (AWD), 18 ALLOY WHEELS, BLUETOOTH EQUIPPED (BT), BACK UP CAMERA, POWER WINDOWS AND POWER LOCKS, 3RD ROW SEATING, CLEAN CAR FAX AND ONE OWNER!! ** Contact Kendall Toyota Alaska today for information on dozens of vehicles like this 2018 Toyota Highlander LE. This 2018 Toyota Highlander comes with a CARFAX Buyback Guarantee, which means you can buy with certainty. Want more room? Want more style? This Toyota Highlander is the vehicle for you. Hit the gas pedal and put the engine power to all four wheels. With AWD, you'll have the greater performance right off the line, everytime you drive. Driven by many, but adored by more, the Toyota Highlander LE is a perfect addition to any home. Kendall Toyota Alaska is honored to present a wonderful example of pure vehicle design... this 2018 Toyota Highlander SE only has 16,011mi on it and could potentially be the vehicle of your dreams! Your buying risks are reduced thanks to a CARFAX BuyBack Guarantee. This Toyota Highlander SE is an incredibly versatile vehicle that is a must have for any family. Sophistication & understated luxury comes standard on this Toyota Highlander SE. Well-known by many, the Highlander has become a household name in the realm of quality and prestige. This is the one. Just what you've been looking for. This outstanding example of a 2018 Toyota Highlander SE is offered by Kendall Toyota Alaska. As a compact SUV, this vehicle packs all the performance of a full-size into a package that easily navigates the urban terrain. You deserve a vehicle designed for higher expectations. This Toyota Highlander delivers with a luxurious, well-appointed interior and world-class engineering. This is about the time when you're saying it is too good to be true, and let us be the one's to tell you, it is absolutely true. Just what you've been looking for. With quality in mind, this vehicle is the perfect addition to take home. ** 2017 TOYOTA HIGHLANDER XLE, GRAY LEATHER INTERIOR, 3.5L V6 ENGINE, AUTOMATIC TRANSMISSION (A/T), ALL WHEEL DRIVE (AWD), BLUETOOTH EQUIPPED (BT), NAVIGATION, BACK UP CAMERA, HEATED FRONT SEATS, BLIND SPOT MONITOR (BSM), POWER WINDOWS AND POWER LOCKS, SUN ROOF, 18 ALLOY WHEELS, CLEAN CAR FAX AND ONE OWNER!! ** Contact Kendall Toyota Alaska today for information on dozens of vehicles like this 2017 Toyota Highlander XLE. This vehicle is loaded with great features, plus it comes with the CARFAX BuyBack Guarantee. In their original incarnation, SUVs were chiefly owned by folks who valued utility above sport. Not anymore! The Toyota Highlander XLE redefines the SUV and makes the perfect all around family companion. Enjoy safety and stability with this all-wheel drive vehicle and drive with confidence in any condition. Just what you've been looking for. With quality in mind, this vehicle is the perfect addition to take home. ** CERTIFIED PRE OWNED (CPO) 2017 TOYOTA HIGHLANDER LIMITED, 3.5L V6 ENGINE, AUTOMATIC TRANSMISSION (A/T), ALL WHEEL DRIVE (AWD), BLUETOOTH EQUIPPED (BT), NAVIGATION, JBL, HEATED AND VENTILATED FRONT SEATS, POWER WINDOWS AND POWER LOCKS, 19 ALLOY WHEELS, BLIND SPOT MONITOR (BSM), SUN ROOF, CLEAN CAR FAX AND ONE OWNER!! ** This 2017 Toyota Highlander Limited is proudly offered by Kendall Toyota Alaska When you purchase a vehicle with the CARFAX Buyback Guarantee, you're getting what you paid for. Perfect for the on-the-go family, this Toyota Highlander Limited is an SUV everyone will love. With exceptional mileage, options and power, you'll insist on driving it on all your outings. Pull up in the vehicle and the valet will want to parked on the front row. This Toyota Highlander is the vehicle others dream to own. Don't miss your chance to make it your new ride. Take home this 2017 Toyota Highlander and enjoy the safety and added performance of AWD. One of the best things about this Toyota Highlander is that it has low, low mileage. It's ready for you to truly break it in. You can find this 2017 Toyota Highlander Limited and many others like it at Kendall Toyota Alaska. Off-road or on the street, this Toyota Highlander Limited handles with ease. Opulent refinements married with exceptional engineering make this the kind of car you'll want to own for a lifetime. This AWD-equipped vehicle will handle beautifully on any terrain and in any weather condition your may find yourself in. 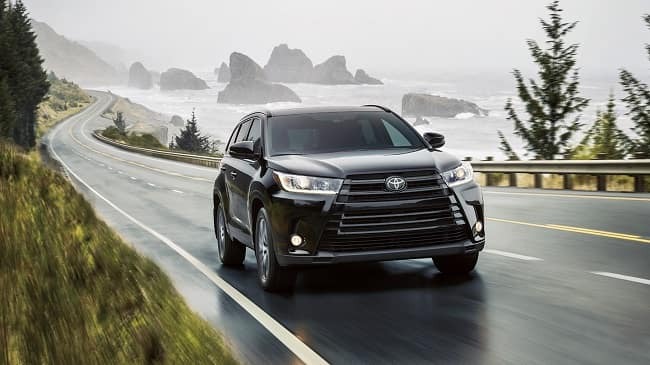 The benefits of driving an all wheel drive vehicle, such as this Toyota Highlander Limited, include superior acceleration, improved steering, and increased traction and stability. The incredibly low mileage and painstaking upkeep on this Toyota Highlander makes it a once-in-a-lifetime deal that won't last long! Call us today to reserve your test drive! At Kendall Toyota of Anchorage, we know not everyone has a new SUV in the budget. This is why we carry a large inventory of dependable used SUVs at Kendall Toyota of Anchorage. You can shop our assortment of used Toyota SUVs, as well as SUVs from a variety of automakers. With many options to choose from, we’re sure you’ll find something at our used SUV dealership in Anchorage that fits your lifestyle and budget. We also serve the Kenai, Palmer, and Eagle River areas. You can also shop for a used truck with Kendall Toyota of Anchorage. Not sure what kind of SUV is best for you? Come to our used SUV dealership today and let our experts help you shop used SUVs for sale in Anchorage. We have something for every budget, lifestyle, and family size. Are you in the market for something equipped to handle tough off-road terrain or just want to easily navigate Alaskan winters? Shop our selection of used SUVs equipped with 4×4 or AWD that will easily take you anywhere you want to go. If you’re in the hunt for a small SUV, take one of our sporty crossover SUVs for a test drove. If you need more cargo space for your weekend getaways, a full-size SUV could be just the thing for you. Be sure to take a look at our 7-passenger SUVs that come equipped with a third row for extra seating, as well. While you’re here, visit our Toyota Finance Center and let our financial experts help you apply for an Anchorage auto loan. You can also apply for a free car appraisal to find out the trade-in value of your current vehicle by filling out our trade-in form. No matter if you’re looking for a compact SUV, midsize SUV, or full-size SUV, Kendall Toyota of Anchorage is the used SUV dealer that has what you’re looking for. Contact us online or come by today to shop our used SUVs for sale in Anchorage.